Worship of The Divine as Mother is a special characteristic of the Indian Culture. God is mostly referred as the Father of all creation or the Omnipotent ruler of Nature in other religions. Navaratri or Navadurga Parva happens to be the most auspicious and unique period of devotional sadhanas and worship of Shakti (the sublime, ultimate, absolute creative energy of the Divine conceptualized as the Mother Goddess–Durga, whose worship dates back to prehistoric times before the dawn of Vedic age. Hindu culture always gave utmost respect to mother. Maa Bharti (our beloved country) is also another roop (avatar) of Maa Shakti whom we worship in Navratri. 2 What is Navaratri’s nine-day importance ? 3 Akhand Jyoti Are Burning Since Several Years, How and Why ? 4 What is Akhand Jyoti ? A whole chapter in the tenth mandal of the holy Rigveda deals with the devotional sadhanas of Shakti. A hymn here describes – “I (Shakti) am the Omnipresent Power. I am the ultimate savior, who stretches and empowers the arc of Rudra to ruin the demonic evils. I alone generate the valor and move the forces in the battlefronts. I am the Mother (Genesis) and the sole Protector of the whole creation. I am in every living being (as the source of life-force). I am the paramount divine power, which knows its unity with the Para Brahm; I am the absolute reality”. The “Devi Sukta” and “Usha Sukta” of the Rigveda and “Ratri Sukta” of the Samveda similarly sing paeans of praise of sadhanas of Shakti. Before the beginning of the Mahabharat war, Lord Krishna had worshipped Durga – the Goddess of Shakti– for the victory of the Pandvas, on whose side laid justice, morality and wisdom. The epic Ramayana also describes Rama’s worship of Goddess Durga. Worship of Shakti in different forms has been popular in Buddhism as well. The reverence of Shakti is the basis of all tantrika practices. The Puranas also describe in parables, stories and anecdotes the pre-eminence of Shakti. 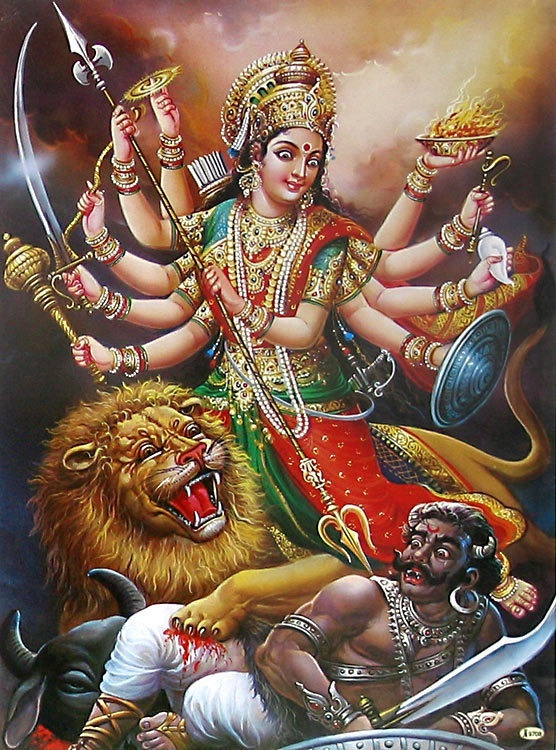 In fact, one of the Puranas- “Devi Bhagavat”- is exclusively devoted to the Divine exploits of Durga. The “Markandey Purana” describes the manifestations of the Supreme Shakti as Mahakali, Mahalakshmi and Mahasaraswati. Mahakali destroys the forces of the evil, crushes ego and eliminates ignorance. Mahasaraswati is the deity of discerning intellect, pure knowledge and creative talents. Mahalakshmi is the Goddess of beauty, harmony, prosperity and progress. The hymns describing the magnificence of the great manifestations of Shakti and the 700 mantras of its sadhanas are compiled as “Durga Saptashati” in this Purana. The Skanda Purana describes the epic incarnation of Goddess Durga. The Brahm Purana and Brahmvaivarta Purana also narrate the divine descent of the powers of the supreme Shakti. Lord Brahma is cited in the Markandey Purana as mentioning to Rishi Markandey that the first incarnation of Shakti was as Shailputri. Other incarnations of the Divine Mother are: Brahmcharñi, Chandraghanta, Kushmanda, Skandamata, Katyayani, Kalratri, Mahagauri and Siddhidatri in that order. These nine manifestations of Shakti, are worshipped as “Nava-Durga”. The fifth chapter of the Rudra Sanhita of Shiva Purana also vividly describes the various Divine Emanations of Durga. Shakti is the original power at the root of creation, limitless expansion and expressions of Nature. It is also referred to as the Âdi Shakti or Brahm Shakti. All the visible and invisible plays of Nature are reflections of this eternal Shakti. All powers originate from it; all existence emerges from it. She is who enables the creation, growth and protection of the universe. She is the Mother of Trinity- Brahma, Vishnu and Mahesh. The Skanda Purana describes this fact in a telling manner– Lord Shiva without Shakti is like a shava (a corpse); Lord Shiva is “Shiva” because of the presence of Shakti in Him. The Cosmic Consciousness Force and its endless expressions also emanate from Shakti. This alone is expressed in the beings as life-energy, consciousness, vigour, courage, intelligence, radiance, thought-power, memory, steadiness, contentment, compassion, generosity, intrinsic light, faith, emotions, etc. The Primordial Shakti generates the potential and tendency of motherhood in the living world. Its different manifestations in the cosmic creation are indeed countless. Shakti is Mahasaraswati, Mahalakshmi, Mahakali as manifested respectively through its sublime, eternal attributes (guñas) of sat, raj and tam. In fact, all the manifestations of divine powers emanate from and merge into the single Brahm Shakti, which is known in the spiritual literature as Gayatri. Since the Vedic Age of the Rishis, the devotional practices recommended during Navratri are primarily those of Gayatri Anushthana. The varied customs of arbitrarily worshiping of this Omniscient Shakti are offshoots of the medieval era of religious anarchy and cultural pollution. In spite of the ignorance and superstitions introduced in this period, the sadhana of Gayatri has maintained its pre-eminence. The light of truth of the Vedic Culture could not be extinguished even in the dark phases of our history. What is Navaratri’s nine-day importance ? The nine-day period of Navaratri is of supreme importance for physical, mental and spiritual health as it lies at the juncture of two seasons. The nourishing energy currents in Nature are at their peak during this transitive phase to eliminate the harmful, negative elements and impressions from our gross and subtle bodies. The sublime domains of consciousness force as stabilized in earth consciousness by the rishis and yogis are most active during this special period. It thus offers us a rare opportunity of expeditiously accomplishing the sadhanas of spiritual elevation. It assumes greater significance in the first decade of the 21st Century, which is prophesied to be the heralder of a new era of Divine Manifestation of life, love and light on earth – through humanity. Laghu Anushthana sadhana of Gayatri is recommended as most suitable for the Navaratri period. It consists of twenty-four thousand japa (repeated rhythmic chanting) of the Gayatri Mantra with meditation on the rising sun and adoption of certain self-control disciplines. Mental or upanshu japa of twenty-seven rosaries (malas) needs to be completed every day for this purpose. This can be done in about three hours’ duration by the people who are used to daily practice of the japa of this mantra. Completion in one sitting in the early morning (by commencing the japa two hours before dawn) is the best. However, depending upon one’s constraints, it could be completed in two to three sittings at convenient times. But the regularity of timings and place where the japa is carried out should be maintained. Ideal sitting posture is sukhasana with erect spinal column. One should not sit directly on the earth. Sitting on kusha mat or cotton cloth is most suitable. Essential disciplines include strict chastity of body and mind and prohibition of using anything made of leather. The subtle properties of what we eat have great impact on our mind. Fasting is therefore prescribed during this sadhana. Depending upon one’s health and level of self-control, the fasting could be observed by consuming only milk or fruits once or twice a day; taking tasteless (without salt and sugar) food; or taking simple and light vegetarian food only once a day, etc. The other common disciplines include – austere life-style; sleeping on a mat on the floor or on plain wooden cot; attending to one’s personal tasks by oneself; observing honesty and humility in conduct. The advanced devotees may also adopt some higher level disciplines that serve the dual purpose of cleansing and purification of the body and the mind and thorough practice of self-restraint. A havan (yagya) should be performed on the last day of the anushthana to mark its completion. The number of herbal oblations (along with loud chanting of the Gayatri Mantra) made in the sacred fire of this yagya should be at least one hundredth of the total number of japas completed. Those who cannot do twenty-four thousand japas, may do the sadhana of chanting the Gayatri Chalisa two hundred forty times or that of writing two thousand four hundred Gayatri Mantras in the nine days, along with adoption of as many of the above mentioned disciplines as possible. The sadhana-anushthans of Gayatri accomplished during the Shakti Parva (Navaratri) will prove to be milestones along the path of spiritual elevation. The grace of Divine Mother bestowed upon the sadhaka would orient his otherwise dry knowledge and ego-centric scholarly attainments towards sagacious activities and altruistic purposes. This would transmute his religious faith and devotion into inner enlightenment without which these are nothing better than emotional excitements and superficial rituals of worship. The hidden force of Shakti awakened within the sadhaka transforms his shraddha (deep intrinsic faith) into nishtha (firm motivation and enlightened faith) towards divine values and noble deeds. The same shraddha, which was evaporating in the void without Shakti, could now be the source of supramental attainments and spiritual awakening. Let us all resolve to be the true devotees of Shakti by completing the anushthana-sadhana of Gayatri on the forthcoming auspicious occasion of Navaratri festival. 1. Navaratri or Navdurga Parva falls during the first nine days of lunar month of Ashwin according the Hindu Calendar. (From 26th September to 4th October this year, check dates for the current year while you are reading the post). Another Navaratri period spans the first nine days of lunar month of Chaitra (the first month of the Hindu Calendar). 2. Upanshu Japa: Rhythmic chanting in which the lips and tongues would move but the voice would be so slow that it can’t be heard (not even as murmuring) even by the sadhaka himself. Akhand Jyoti Are Burning Since Several Years, How and Why ? Devotees light akhand jyoti that keeps burning throughout the nine days of navratris. This jyoti represents the immense devotion for Goddess Durga. It is also a message to the devotees to never lose hope even in worst circumstances just like the little diya lights even the darkest places. It also shows that devotion will bring the light of knowledge in your life. What is Akhand Jyoti ? According to ‘mantra mahodadhi’ (the holy book of mantras), any chanting performed before fire (agni or deep) yields better results. ‘Deepam ghrut yutam dakshe, tel yutah ch vamatah’ Meaning: Diya with ghee should be kept on the right hand side of the Goddess and the oil lit diya should be kept on the left hand side of the Goddess. The akhand jyoti should be kept burning throughout the nine days. Keep a small diya in case you need to add oil or move the wicker of the akhand jyoti then light the small lamp with the akhand jyoti and keep it aside. If in any case the akhand jyoti blows out then you can use the small lamp to light it again. Make sure you blow out the small lamp by dipping it in ghee. For devotees its is divine snan of Goddess, for others its miracle. About 70 KM from Udaipur, there is a temple of Idana Mata where Mata’s idol take agni snan (bath of flame) on its own, burning the cloths, chunars offered by devotees to Maa. This phenomenon can happen on Sundays. No one knows the source of flame. It is indeed divine intervention of Goddess. The agni snan of Idana Mata ji is unique in world. It is believed that one who comes here to pray – his/her wishes are fulfilled. People suffering from ailments and diseases come here to get treated with the blessings of Idana Mata Ji. But miraculously her ornaments never melt, nor become fragile during this agni snaan (bath of flame). The divine snan of Idana MataJi is one of its kind across the globe. Jawala Ji temple is one of the 51 Shaktipeeths of India. Jawalaji Temple is one of highly venerated shakti temple in India. It is situated in the lap of Shivalik range of Kangra valley called “Kalidhar”. This is believed to be the first ever temple built by the Pandavas. Jawala ji is a Devi Temple Dedicated to the “GODDESS OF LIGHT”, located in Jawala Mukhi, district Kangra of Himachal Pradesh. Sati’s tongue is believed to have fallen at the very place where Jawalaji Temple is now situated. 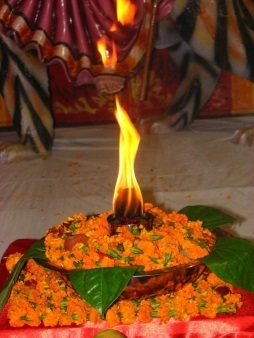 The tongue of Sati is represented by Holy Flame or Jawala that is perpetually burning. The flames come out from nine different rocks in the temple. Jawala Ji has an unique characteristic of perpetual flames emanating from the rock at temple site being considered the manifestation of Goddess. Jawala Ji as a center of faith is unparallel and unique. There is no deity or idol that is worshiped. Jawala Ji is a great heritage center for not only the people of Jawala Mukhi, Kangra or Himachal Pradesh but of the whole world. During March to April and September to October every year colorful fairs are held during the Navaratra celebrations. Jawala Ji has since times immemorial turned out to be a great pilgrimage center. The fanatic follower of islam Emperor Akbar once tried to extinguish the flames by covering them with an iron disk and even channelizing water to them. The cruel emperor Akbar tried hard to put off fire umpteen times but failed and the flames blasted all his efforts. Akbar then presented a golden parasol (chattar) at the shrine. However, his cynicism and arrogance at the power of Jwala Ji devi caused the gold to debase into another metal which is still unknown to the world. His belief in the deity was all the more strengthened after this incident. No one knows anything about this unique metal. Thousands of pilgrims visit the shrine round the year to satisfy their spiritual urge. Devotees in a large number throng into temples across the city, Patna, to offer puja to deities during Navratri celebrations today. One temple located near Golghar record more devotees every year. Thousands are pouring in everyday to see the Akhand Jyoti (perpetual light). Regular devotees believe that nobody goes empty-handed from the door of the Mata and their wishes are fulfilled. The temple witnesses maximum number of devotees on Tuesdays as it organises a special puja. During Navratri, festival which occur before Diwali, devotees queue up since morning. The temple management has assigned volunteers to help in the security arrangements amid heavy rush in the temple. During this period, special prayer services including bhajans and kirtans are performed in the temple. The Asamai temple is at the foothills of the central hill Koh-i-Asamai of the Afghan capital. The hill is named Asamai after Asha, the goddess of hope said to be present on the hilltop since ancient times. The Akhand Jyoti (continuous fire) there has been burning uninterrupted for many centuries. The temple and the Jyoti have survived numerous conflicts in Kabul and are reminders of Afghanistan under the Hindu Shahi kings. The Asamai temples of New York, Faridabad, Frankfurt and Amsterdam are named after the famous Kabul temple. The temple of Shakti devoted to the mother goddess is located in the heart of Dhanbad city on the Joraphatak Road. The special attraction of the temple is the Akhand Jyoti or the eternal flame that has been brought from the very revered Jwaalaji shrines of Himachal Pradesh. The temple has been named after Goddess Durga’s form of Shakti, which translates to Goddess of Power. This temple dedicated to Goddess Durga throbs with devotees on all the auspicious occasions like Dussehera and Diwali, and on those special days of the week, Tuesdays and Fridays, when the mother is revered. 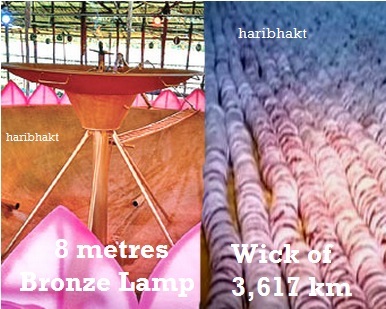 A Bronze Lamp with the longest wick, 3617 km, to burn for 108 days. The unique bronze lamp, with a radius of 8 metres, is fed with hundreds of litres of Til (sesame) oil everyday and its 4-inch thick wick is driven by hand-held machines. after navratri fast and havan on last day.after that my pet bird 14yrs was died without any reason.what it means.bird use to participate all religious activity daily with us,.what it does mean? Last year during navratras on ninth day of Navratri at our home Durga Maa took Agni Snan. Could you please tell me what does that mean? Agni is considered as pious and destroyer of darkness. Agni Snan by Durga Maa Signifies conquering darkness with light and purifying the energy around. Generation of very high magnitude positive energy help all devotees in eliminating negative energy around, while protecting us.